I first heard about clay when I applied it to my skin as a face mask, but little did I know how many wonderful uses clay has. Clay’s healing properties have been known since ancient times, and it is still popular in alternative medicine today. According to wikipedia, clay is a general term including many combinations of one or more clay minerals with traces of metal oxides and organic matter. 1. Bentonite clay– bentonite clay usually forms from weathering of volcanic ash, most often in the presence of water. 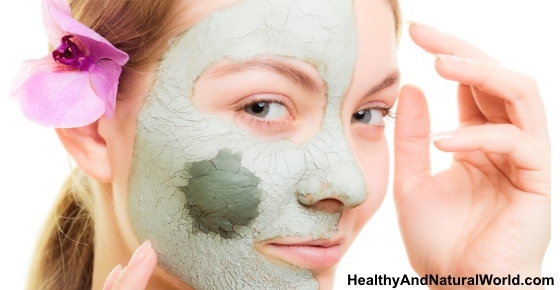 Bentonite clay has some antibacterial properties that help to combat acne and is a powerful detox agent. 2. Green clay – green clay is loaded with iron and magnesium which gives it its green color. It acts fast to absorb oils and toxins, and is suitable for oily skin. 3. White clay – also called kaolin. This is a very gentle clay, and is suitable for sensitive, dry and mature skin. It softens, exfoliates and purifies the skin. It has many benefits including antibacterial and detoxification properties. This type of clay can be used on a daily basis to help clean the skin and remove toxins and dirt from the pores and helps to regenerate cells in the skin. 4. Fuller earth – this is a clay-like earthy material that absorbs bacteria and toxins. It is used as a body or face mask and has a slightly gritty texture that is great for exfoliating. It also has antiseptic properties. You can buy all the different types of clay I mentioned online in Azmaon (here or here). Bentonite clay is a powerful detox agent. It is naturally absorbent and gentle on the body’s systems. It contains a certain mineral called montmorillonite, which is believed to be the primary component responsible for its health properties. Bentonite clay also contains magnesium and many other trace minerals that attract all sorts of toxins, including bacteria, heavy metals and pesticides. It enriches and balances the blood, absorbs radiation and neutralizes poisons in the intestinal tract. Bentonite clay is very versatile, and is used to treat a large number of physical conditions, such as bloating and constipation, food allergies and food poisoning, colitis, viral infections and parasites,. Bentonite clay helps to detoxify the liver, cleanse the colon, strengthen the immune system, alkalize the body and helps to improve the bacterial balance in the digestive tract. How to use bentonite – bentonite clay comes in a powder form. Mix 1 tsp of the clay powder into eight ounce glass of water and drink the mixture on an empty stomach and at least one hour before eating or taking other supplements or herbs. This is because you don’t want the clay to interfere with the absorption of beneficial nutrients in your food. A daily regime can be as long as three weeks; then take a break of at least a week. While bentonite clay is considered to be safe for the body, you will need to consult with your doctor if you are taking any prescription medications or having high blood pressure or if you diagnosed with iron intolerance. You can use clay externally as a poultice or DIY body wrap or by applying a paste of clay and water on any skin irritation like blemishes, insect bites, cuts, burns, and other skin irritations and common skin conditions, such as eczema and psoriasis. To make a poultice, add water to the clay until you get a paste that holds together and doesn’t fall apart. Then place it on a clean dressing and place gently on the body. Allow time for the affected area to stop hurting. The clay will fall off naturally when it finished its job. Another use of clay is as a body wrap in spa treatments to get glowing skin, remove the dead layer of skin and draw toxins from the skin. On a deeper level, clay wraps can relieve joint, rheumatic and arthritis pain. Use 2 tablespoons of your favorite clay and mix with enough water to form a thick paste. Apply the clay mask to your forehead, nose, cheeks, and chin where blackheads tend to appear. Leave to dry (should take about 20 minutes). Rinse your face with cool water to remove the clay and impurities from your skin. Apply the clay mask once or twice a week. Honey has antibacterial properties and is commonly used in face masks (like these ones) and to treat acne. Mix 1 tsp. raw organic honey, 1 tsp. bentonite clay (or other type of clay) and enough water to make a paste (optional: you can add a few drops of tea tree oil which is one of the best essential oils for acne). Apply the mask to your face and leave for 20 minute and then rinse with warm water. Repeat the mask once or twice weekly. Mix a small amount of your favorite clay with some jojoba oil and make a paste. Gently apply to the skin and leave for 15 minutes. Gently rinse off with water. Apply a small amount of jojoba oil to moisturize the skin. Clay baths help to detox the body, as well as soften and rejuvenate your skin. Here is an easy recipe for bath salt that adds minerals to the bathwater that cleanse the skin. Apart from white clay, this recipe contains borax which is a natural mineral salt found in a few places in the world. Borax occurs naturally in evaporate deposits produced by the repeated evaporation of seasonal lakes. Combine the first 3 ingredients and mix it evenly. Add essential oil. The mixture will absorb a lot of essential oil, so the guideline should be a strong smell because the salts are going to be diluted when you mix them in the bathwater. Cover the mixture with a breathable cloth and let is sit to dry for several hours. Then mix again well. Add 4-6 tbsp. of the mixture to the bathwater and wait for it to dissolve before bathing.